3-way electric ball valves for oils and fuels. 3-way valves have an L-bore or T-bore, and may be used in all directions of flow. They open and close in seconds, are reliable and have a low energy consumption. 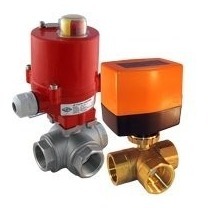 Electric ball valves are available in several voltages. In addition, there are multiple options for electrical control, such as 2-point (open-close control, with internal relay) or 3-point. Note that electric ball valves need electrical power for both opening and closing.